weekly student sessions led by faith-filled adults who engage and challenge students to a deeper understanding of Jesus Christ with the goal of a more personal and spiritual relationship with Him. 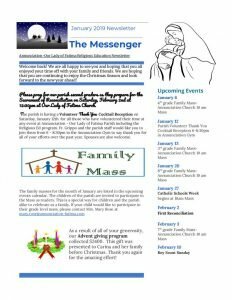 prayer and reflection based in sacred scripture and sacred tradition including monthly communal experiences of Catholic practices such as Stations of the Cross and the Rosary. seasonal celebrations of the Church year to foster enjoyment of the Church’s sacred traditions. 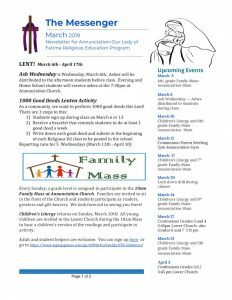 special events to prepare students and their parents for the celebration of First Eucharist, First Reconciliation and Confirmation. a community environment where all families feel welcome and enthusiastic in their love for Jesus Christ and the practice of the Roman Catholic faith. 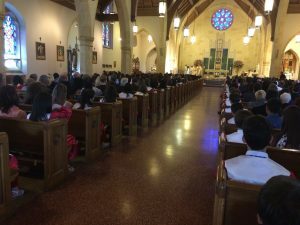 Our program follows the Archdiocesan Curriculum Guidelines which may be found here. Please note that our 6th and 7th grade curriculum include summer work in order to complete the curriculum by Grade 7. 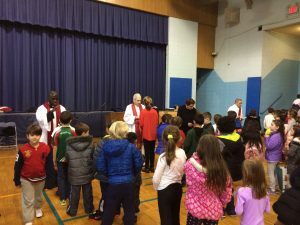 General Religious Education sessions meet on Wednesdays at Annunciation School beginning in the middle of September and ending the last week of May. Grades 1-5 meet from 3:30-5PM. Grades 6 & 7 meet from 7-8:30PM. 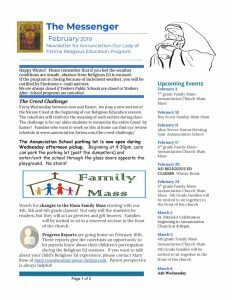 Please see Religious Education Calendar. An option to home school is available to families. Please contact the Director of Religious Education, Mary Rose, at mary.rose@annunciation-fatima.com. Religious Education sessions for students with special needs meet on either Tuesdays or Thursdays at the Pope Francis Mercy Center beginning the third week of September and ending the last week of May. 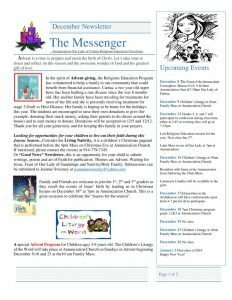 Please see SN Religious Education Calendar. 1.) Fill out the registration form. Please be sure to fill out both pages completely and sign the bottom of the second page. If your child has allergies, please fill out the allergy agreement. 2.) If you are registering a 1st year student or a new student, please attach a copy of his or her baptismal certificate to the application form. IMPORTANT NOTE: If your family has not already registered with the parish, please do so before submitting your registration forms. 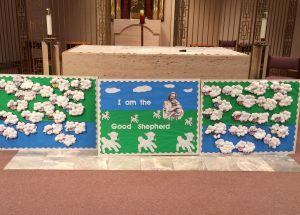 You may register on-line at www.annunciation-fatima.com/new-to-our-parish . 3.) Pay the registration fee either using a check or cash attached to the registration form OR paying on-line at www.annunciation-fatima.com/religious-education/fee-payments. Drop off at any time to the Annunciation-Our Lady of Fatima Rectory, 470 Westchester Avenue. In-person on Wednesday, September 12 from 3:30-6pm in the Annunciation School Gym. General Religious Education sessions begin on Wednesday, September 26th in the Annunciation School gym. Special Needs Religious Education sessions begin either Tuesday, September 25th or Thursday, September 27th at the Pope Francis Mercy Center. The annual calendar will be sent out in September. Due Dates: Families should submit the forms and payment by September 12, 2018 for the September 2018 session. Special Needs Program: Parents of students with special needs must contact the Coordinator for Religious Education for Students with Special Needs, doreen.napolitano@annunciation-fatima.com, for class placement. 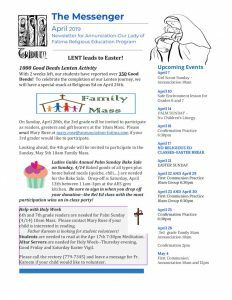 If you have any questions, please contact the Religious Education Office via e-mail mary.rose@annunciation-fatima.com. Thanks for your commitment to religious education for your family! We look forward to seeing you in September.